This morning was busy at our house. My oldest, A., was up early so he could get dressed in his full piping kit, ready to play at the high school’s Remembrance Day ceremony and then in downtown Oakville at the cenotaph. My daughter S. came downstairs looking beautiful in all-black concert dress because she would be singing with the vocal ensemble at the same assembly. When the two younger ones seemed to be doing an extraordinary amount of fussing, I realized they were looking for red and white shirts to wear to their own school’s assembly. 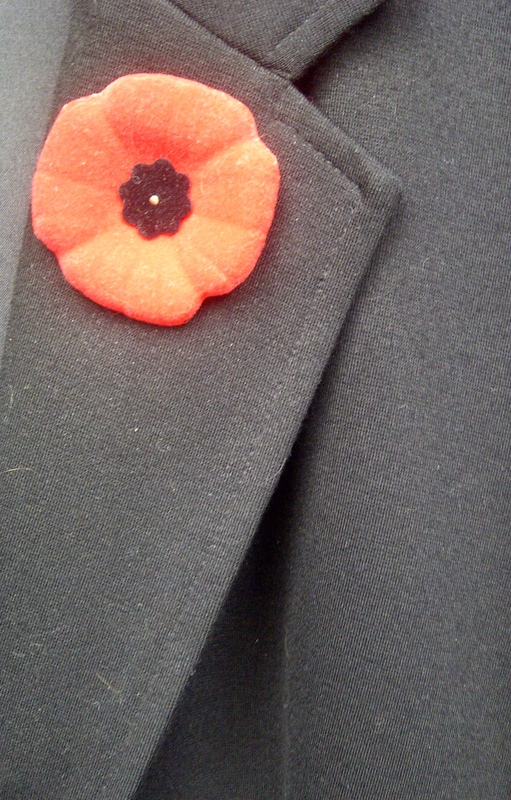 They needed money to donate in exchange for their poppy, too. Even my husband, whose work at the office didn’t start until the afternoon, was showered, shaved and dressed his best first thing in the morning. He was going to the cenotaph with the manager of the funeral home. After they had all left in a flurry of poppies and music folders I found myself alone in a quiet house. I was standing in the kitchen near the sink considering the silence when I remembered the women. Today while my children read, “In Flander’s Field” and my husband helped lay a wreath commemorating the war dead, I was at home making soup, looking out the window as the rain started and worrying about my son being cold. How many women have done this very thing, I thought to myself. How many stayed home and cooked, staring out the window and worrying about their fathers and brothers and husbands and sons? While in today’s world soldiers are both men and women, I wonder how hard it was for those women left at home in the World Wars when towns and cities in Canada were being emptied of men. They faced loneliness, fear, and the difficult task of keeping body and soul together with scant resources. It must have been so hard to get up every morning to face that struggle alone. One of the ways they coped was by planting Victory Gardens, also known as War Gardens or Food Gardens for Defence. Governments in Canada, the United States, the United Kingdom and Germany created advertising campaigns to encourage the growing of food with slogans like “Sow the seeds of Victory” and “Your Victory Garden counts more than ever!” Backyards, rooftops, empty lots and public parks were converted to growing spaces for fruits, vegetables, and herbs. Some estimates suggest that in 1943 there were more than 200 000 of these gardens in Canada. Victory Gardens were promoted as a way to help ease food shortages and free up more energy and land for the war effort, but it was also hoped that those at home would feel good about making their own contribution. I am sure that for many women, those victory gardens were a godsend. Fresh air and exercise are always a good antidote to stress and anxiety. Food for themselves and their children must have been a relief in the midst of harsh rationing. But finding a way to help must have been important, too, when they found themselves staying behind while the men went off to fight. I admire those women who stayed home. Today I remember their quiet courage, their practical spirit, and their determined perseverance. I celebrate the sacrifices they made without uniforms or guns. And I embrace with deep gratitude the knowledge that even though I said goodbye to my loved ones this morning, all will return tonight safe and sound in this land of peace. This entry was posted in Uncategorized and tagged food, garden, life, vegetable. Bookmark the permalink.